Below are various interests that I entertain ... Click to enlarge any photo. 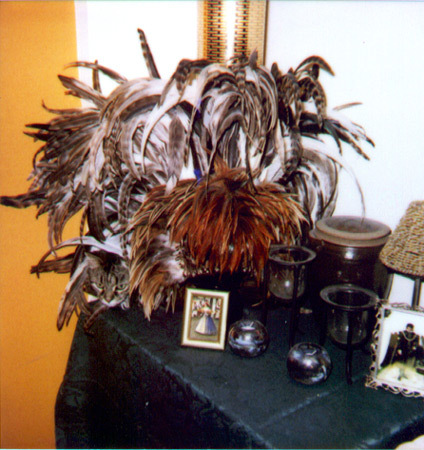 You can read about How I Got Started In Costuming, my cat hair donors, or my Gardening interests. If you are wondering how I got started doing historic costumes, you can blame it on the Girl Scouts! Yes, that's right, I was a Senior Girl Scout. But it was a very cool scout troop, we didn't do much of the standard Girl Scout stuff. For example, in my Girl Scout troop I learned how to throw knives and tomahawks. The main focus of the troop was doing community volunteer work at Sandridge Nature Center on the south side of Chicago. Our job was to do pioneer craft demonstrations in the log cabin which had been built there. 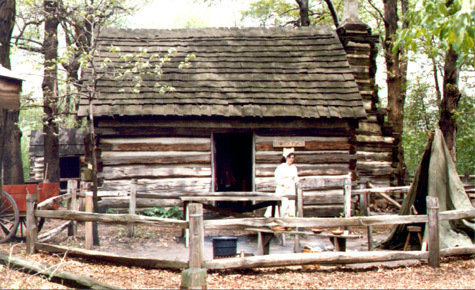 The cabins and environment are modeled on buildings that might have been built in northern Illinois circa 1818 - the year Illinois became a state. This is a picture of the back of the smaller, second cabin at Sandridge along with an 18th century 'wedge tent'. And here's a pretty pioneer harvest tableau from Sandridge Nature Center. At Sandridge, they are doing a prairie restoration which is trying to repair a small part of the damage done to the local eco-system. This is a tall grass prairie, and they aren't kidding about the 'tall' part. I was *standing* next to the prairie area when I took this picture, the grass in the foreground is well over 6 feet tall. Of course it's not really a costume if it doesn't have cat hair on it! I am owned by two enthusiastic cat hair donors. This is Isabeau. She is the world's cutest cat - just ask her, she will tell you loudly and at length. For extra credit, find Isabeau in the picture! This is Sam - He's 20 pounds of pure coward! Just when you think you know your cats, they do something really, really cute that you've never seen before. Sam climbed in here all by himself, honest! 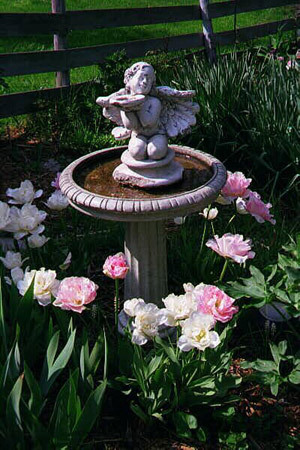 Here's an old birdbath surrounded by some 'Angelique' (pink) and 'Tacoma' (white) double tulips. This picture was taken in late spring during the last flush of spring bulbs. 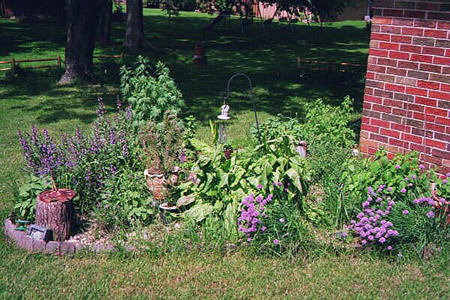 Here's a shot of a section of my herb garden which happens to bloom all in shades of blue in May. A clump of cheery tulips. This is a bearded iris called 'Night Edition'. 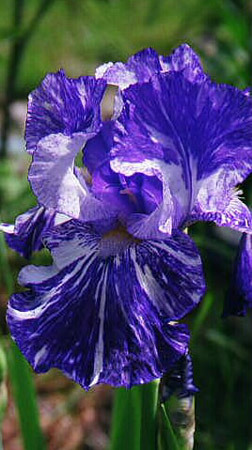 This is a bearded iris called 'Batik'. 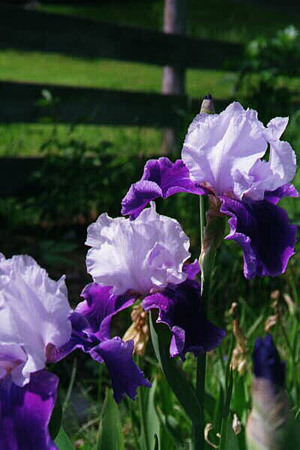 This is a bearded iris called 'Fortune Teller'. I have quite a few roses in my garden. I have a small collection of David Austin Old English Roses along with several Old Roses which I'm hoping will bloom profusely next spring. For now I will share with you some of the David Austin blooms. This one is called "The Squire" and is a lovely deep red with a beautiful scent Here is another David Austin rose called "The Pilgrim". 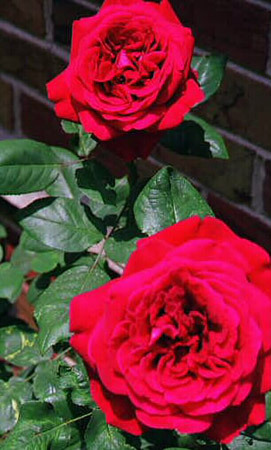 He often names his roses after famous British literary figures, this one is named for a character in "The Canterbury Tales". 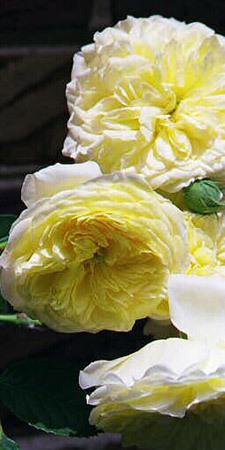 I really like David Austin's yellow roses, they are a very soft, easy yellow in contrast to the often harsh and glaring yellows of hybrid tea roses.....and of course it smells great! This rose is called "Tradescant" and is a David Austin rose named for a Jacobean father and sone who were noted herbalists and gardeners. It has a small, deep, blue/red blossom with a very nice fragrance. I also grow an Old Rose called 'General Jaqueminot' which is a Hybrid Perpetual and the blossoms are very similar with the identical size and petal pattern but Tradescant is slightly more blue than the deep red of General Jack. 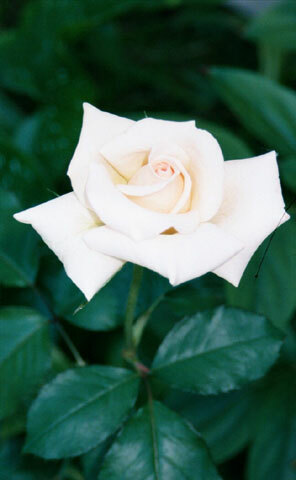 This rose is named "Cymbeline" after an ancient British king in the play by Shakespeare of the same name. The rose is unique with an unusual rose/grey color and a fragrance that reminds me of licorice. 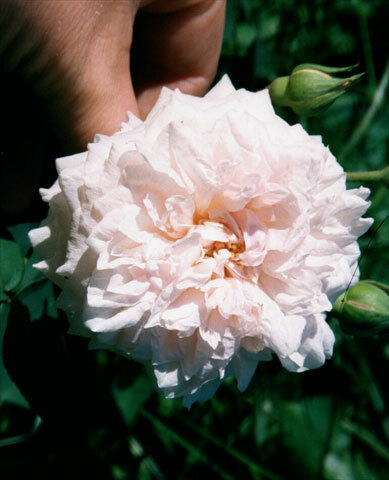 Souvenir de la Malmaison is an old Bourbon Rose first bred in 1843. 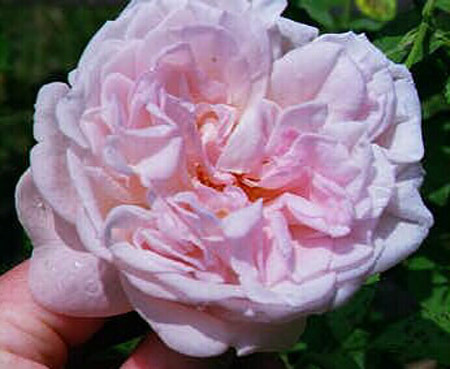 It has a lovely soft blush color and a very nice scent of a powder rose. This rose is called 'Cloud Dancer' and it's a hybrid tea rose which is apparently rather uncommon. 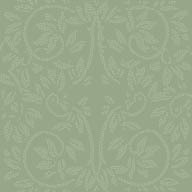 It has a nice ivory color edged with pale pink. The smell isn't too strong and is very heavy on the 'tea'. 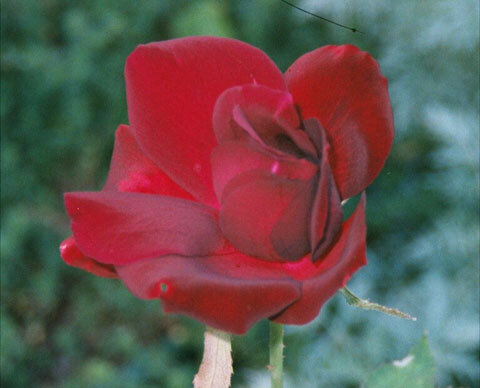 This is a rare hybrid tea rose called 'Lady Sackville Night'. My friend Robin bought this one and I'm sort of 'baby sitting' it because she doesn't have a yard to put the rose in. The petals unfold in an unusual fashion which is why this bloom looks a bit lobsided. 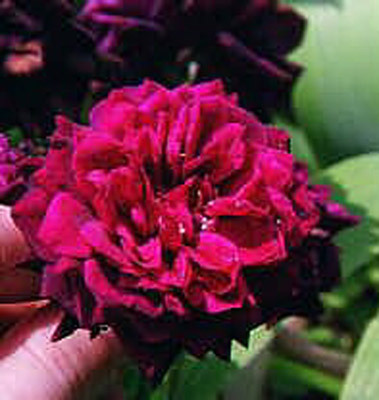 The color is a deep red and the scent is very strong.